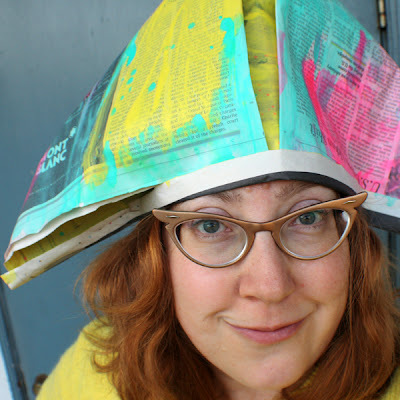 Today's hat is one that is glue free. 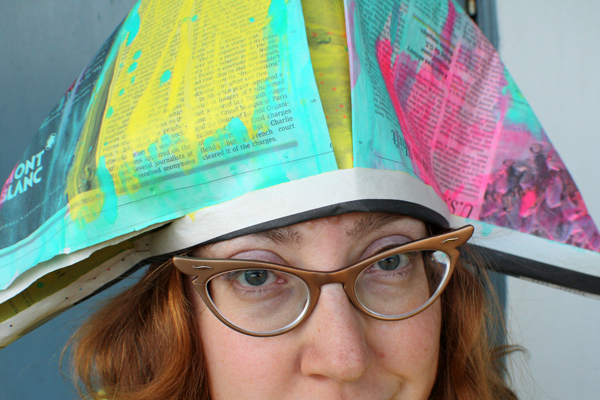 The classic newspaper hat a la dilly-do! 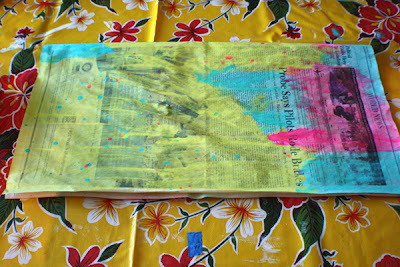 The only difference is, I invite you to paint up your swath of newspaper before you get to folding. The paint will dry and give your newspaper a slightly shiny look while giving it a little boost in the sturdy department as well. 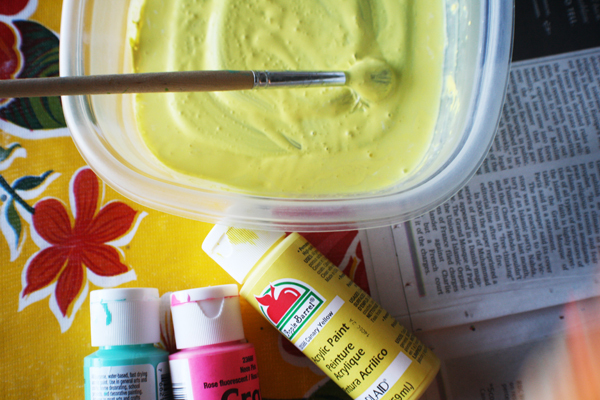 Set up your paint by squirting a trio of colors onto your kiddo's palette. 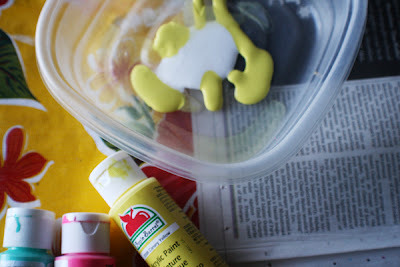 Add a squirt or two of white glue and a smidge of water (no more than a tablespoon) to each color and have your kiddo use a clean paintbrush to blend each color. 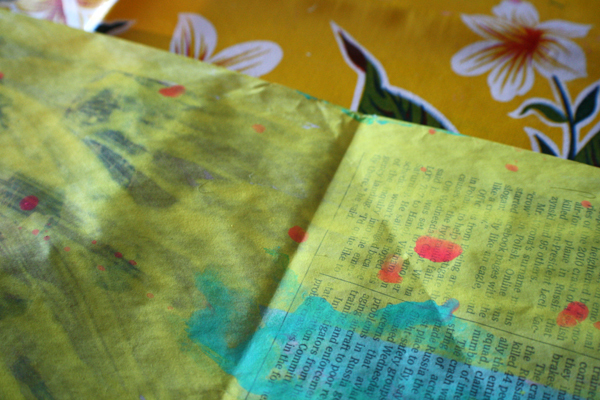 The water will thin the paint allowing it to cover the newspaper a wee bit more quickly and the glue will give your newspaper a little more shelf-life. 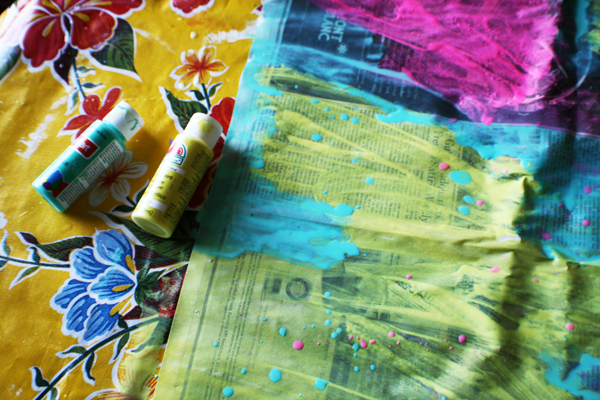 Have your kiddo paint up a storm. The larger the brush the quicker the coverage. Sticking to three harmonious colors will keep the hat from being a muddy mob. Though, there is nothing wrong with muddy and kiddos relish the process of mixing their paint colors. If you want to keep their hat from becoming muddy, choose two shades of their favorite color and then add a dollop of white. They can mix to their heart's content and you can have a happy photo. Or, stick to two primary colors and white then they can mix up their own secondary color. Paint as a color theory tool is an awesome thing! Set aside to dry. 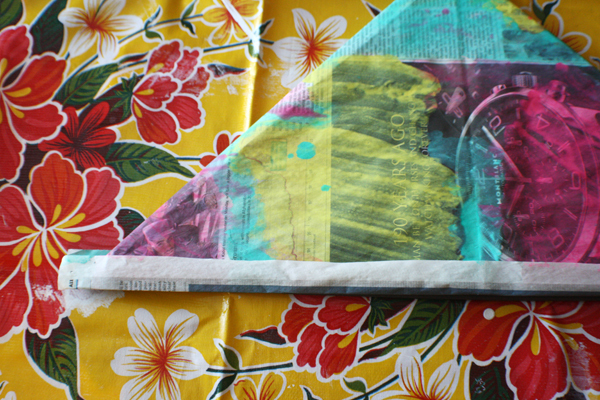 First fold your squarish sheet in half, painted side out. Next up, fold in half to get a crease to mark your middle then pull the corners down to make a bit of a triangle. Do not pull them all the way down to the bottom and make sure your fold is at the top so that the bottom will ope to create your hat. 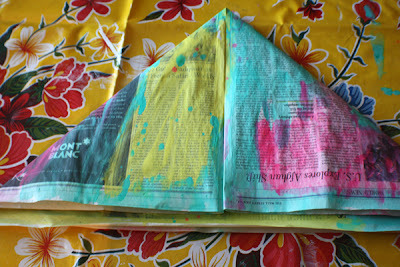 Fold up a brim from the bottom. Add a helpful piece of tape or two to keep the hat from unfolding and pop that bit of happy on your kiddos head and go exploring! 25 valentine projects for you and yer kiddos! ten hats in ten days: box tops!